The Central Market Hall in Budapest is one of the most visited Budapest attractions for both its architecture and its superb fruits, vegetables, special Hungarian foods, and also for some of its gift items (like the lively red Hungarian paprika). 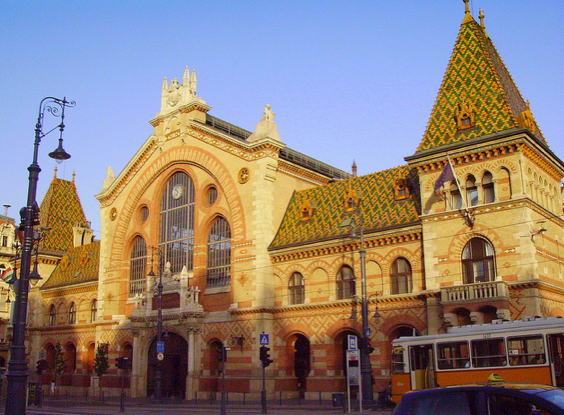 But when can you visit the Central Market Hall in Budapest? Is it open at the weekends? Additional info: Budapest Central market Hall is located on the picturesque Danube embankment, by the Liberty Bridge, on a square called Fovam (fur-vahm), i.e. Fővám Tér in District 9. 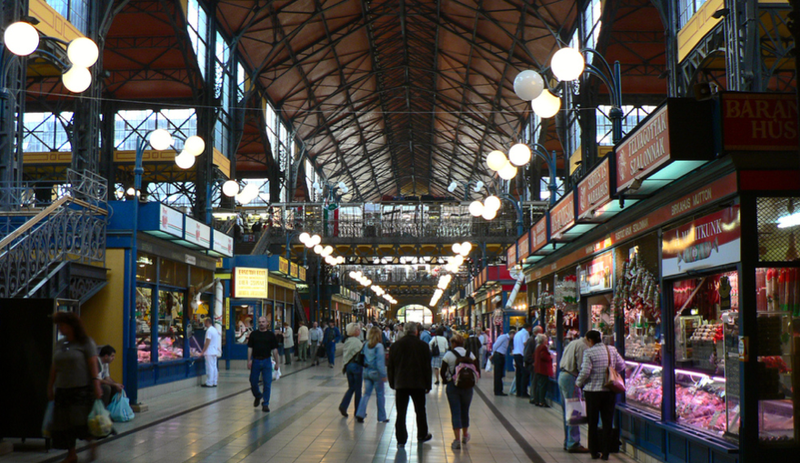 This is the largest indoor market in Budapest designed and built by Samu Pecz around 1896. The roof of the Central Market Hall is beautiful, colorful, featuring the same kind of tiles like the Matthias Church in Budapest (the trademark tiles were made by an ingenious Hungarian tile master, Zsolnay). Hello Igor, yes, November 1 – All Saints’ Day – is a public holiday in Hungary, unfortunately the Market Halls are closed on this day in Budapest, including the Central Market Hall. What about Monday on Okotober 31., will be open this day? I’d say don’t bother to eat upstairs. It can be expensive, and not very good. If you need to. check out what and where the oldest Hungarians are eating. Could you please tell me if the Central Market Hall will be open on Easter Monday April 6th? Please tell me what the hours will be for the Easter Weekend. April 5 and April 6. Thank you. Could you please tell me if the 6th of december 2015 the central market will be open? I would like to be sure I can come to visit it. Hello Raffaella, unfortunately the Central Market Hall in Budapest is closed on Sundays, so it will not be open on Dec 6 in 2015. You can make a visit on Dec 5 or Dec 7. Could you tell me if the 16th May the central market will be opened? I think this day is a catholic hollyday. Will the market be open this Saturday 20 August? I know it is a holiday in Hungary. Could you please tell me if the Market is open on th 31st October? Hi, will central market open on 23 Dec to 25 Dec? Thanks. hello, is the market open on 23/24/25/26 December and what is the opening time? Hello. How are the opening hours for Vásárcsarnok on December 23rd? Thank you very much for your reply in advance. Will the Central Market hall be open on Monday the 2nd April 2018? I was wondering if the market is open on Easter Monday? Hi, will you be open tomorrow? As I know tomorrow is a public holiday in Hungary. Thank you. I am in Budapest and I was wondering if the Great Market Hall would be open today 2nd of April (Easter Monday). If that is the case, do you know the timetable? Hello, Does the Market Work 1.5.2018? thank you. Will the Great Market Hall be open Dec. 24-26? Hello. Will it be open Monday and Tuesday 21/22 October? Due to the national holiday, I’ve heard mixed reviews. Good Afternoon, could you please advise on opening times from 30 December 2018 to 3 January 2019? Much appreciated. the market hall will be open from 6 am to 6 pm. Have a great holiday in December Budapest! the Great Market Hall will be open from 6 am to 3 pm on Dec 31! Will the hall be open this year with Christmas? It is closed on sunday, also on sunday 23rd? And what about 25th and 26th? Dec 23 will be gold Sunday, so the Great Market Hall will be open from 6 am to 3 pm. The markets are closed during Christmas, Dec 25 and 26.
unfortunately, the market hall will be closed on Dec 31. Will be in Budapest April 19-21. Will you be open Friday, April 19th or Saturday April 20th as that is Easter weekend? the Great Market Hall is normally closed at Easter (Sunday and Monday), and on Good Friday (Apr 19) too. I am sorry that I could not be more helpful at this moment. the Great Market Hall will be closed on Nov 1 (the market is closed on Sundays in general and this year in 2019 Nov 1 is a Sunday). Thank you for your kind understanding.